If the headline of this article "How To Become a Millionaire" sounds like an infomercial, don't be deceived. It's not. The advice on how to become a millionaire is based on proven tactics used by millionaires in the United States who did not inherit their money and do not earn millions of dollars a year. In fact, you may not know it, but you may have one or more of these millionaires living next door to you. An important lesson learned from the book "The Millionaire Next Door" is the secret of how many Americans become millionaires. These are everyday people like you and me. Yes, they might have a nice home and cars and take nice vacations, but they are not extravagant. They don't have the largest house on the block and don't drive the fanciest cars. Cars and houses are not status symbols to these millionaires next door. Will I still be satisfied if I spend less? Can I find a version of this product that costs less but is still good quality? Would I rather have a TV with all the latest technology or would I rather be wealthy? Would I rather buy a car that is so expensive that I have to stretch the payments out over five years or would I rather be wealthy? Would I rather take a $5,000 vacation or would I rather be wealthy? If you want to follow the steps to becoming a millionaire, there are tried and true approaches and methods that can get you there. Here is a ten step method you can follow. Be sure to evaluate your position and assess results as you follow these steps. Keep in mind; you can become a millionaire no matter your income level. Have a written financial plan that includes your goals, your net worth, your debt-to-income ratio, your savings and investing plans, and your monthly budget. Save money automatically by having at least 10% of your salary automatically deposited in your savings account each pay period. Contribute enough to your 401(k) plan to maximize your employer match. Live below your means. Remind yourself that he who hesitates when it comes to shopping often decides he doesn't need the item after all and doesn't want it as much as he thought he did. Avoid using credit cards unless you can, and will, pay the balance off in two months. If you have credit card debt, concentrate on paying it off as quickly as possible. The interest you're paying is money you could be saving. Invest in mutual funds and have money deducted from your bank account automatically every month to invest in these funds. If possible and feasible, own your own business. Millionaires are rarely created by constantly seeking out the highest returns on investments, or constantly moving money from one investment to another to chase higher returns. 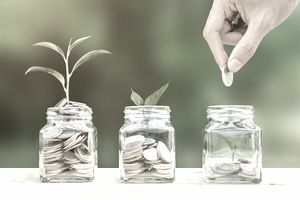 Millionaires educate themselves about investing and seek professional advice, choose high-quality blue-chip stocks or mutual funds with good long-term performance records, invest consistently, and hold onto these quality investments over a long period of time. If you notice from the steps above, getting to millionaire status doesn't involve making large purchases, dressing fancy, or buying luxury items. Millionaires live well below their means. As you can see, this proven method of becoming a millionaire is not rocket science, and it really is attainable for many Americans.